Thirsty Travels | Passion for travel, good drink, good music and grace. Passion for travel, good drink, good music and grace. Vineyards to the left and vineyards to the right! I just got a new phone. It was time to clean out the old phone – messages, pictures, etc. I thought it might be interesting to see the 2012 year-in-review according to a select group of my cell phone pictures. I take a lot of pictures when I travel, so not every place ends up on the phone, but it’s a good random 2012 year in review. It shows I am certainly blessed with wonderful a family, great friends and a good life. At the comic book museum in Baltimore. Peabody was the genius dog who adopted bright but naive Sherman. How often are you on a flight and they tell you that the windshield just cracked and they need to make an emergency landing? It did not show up as ominous as it really was, but the storm line moving in was awesome and powerful looking. 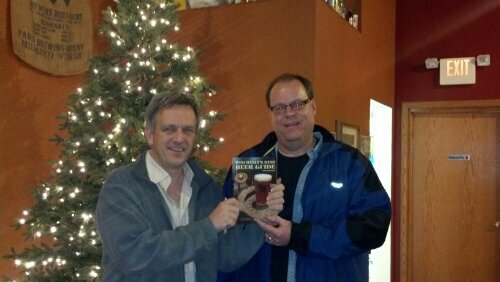 Author of Wisconsin’s Best Beer Guide came to Sweet Mullet in Oconomowoc for a signing. Dude was shot crossing the road in Utah – couple of times at least. I still open the basement door expecting to see her. I love clouds – these were good ones. You can always hear them first even if in the house with all the windows closed. Sharon hits the big 5-0. Someday Tim will catch up I’m sure. Jeremy only owns a white wine boat. Some day he’ll have a red one too – we hope. For now, no worries. Man was it a cold night in September. I remember the “special” wine we brought to the celebration was corked. I have about a million pics of Fergus but only a couple on the phone in 2012. Here he is, where he is not supposed to be. Tom petting the dog in an Oconomowoc store. We tossed a bone in Kickstarter to our new friend Mike Brenner. He came out to the house to brew with Ryan and I. I have other pictures of him brewing with us, but on my phone only this picture of the black gold. The Stout had everything and the ingredients broke the bank. 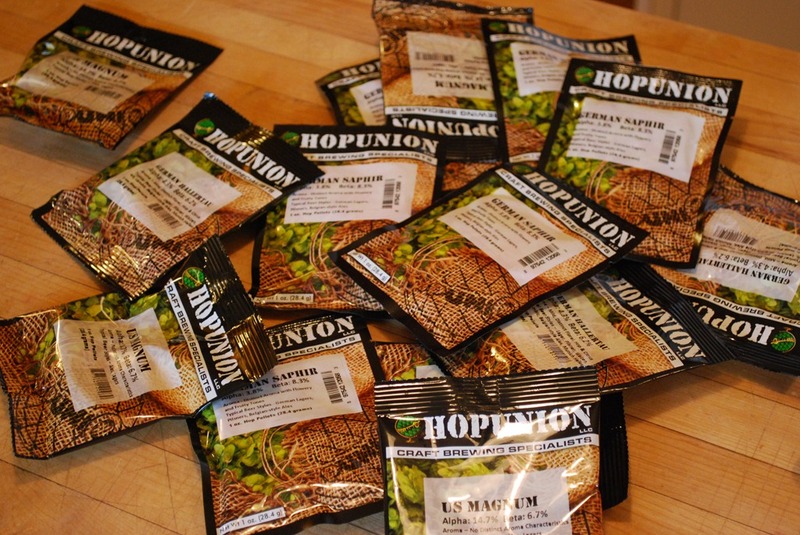 Our Backyard Beer – Hops Vertical Tasting. Thanks to the folks at Sonoma Cellars for stocking all of these special Mikkeller IPAs. Pictured here are Magnum, Palisade, Challenger and Tettnanger. What was our favorite? I don’t recall. I guess we just need to trust our own taste. I know what I like. 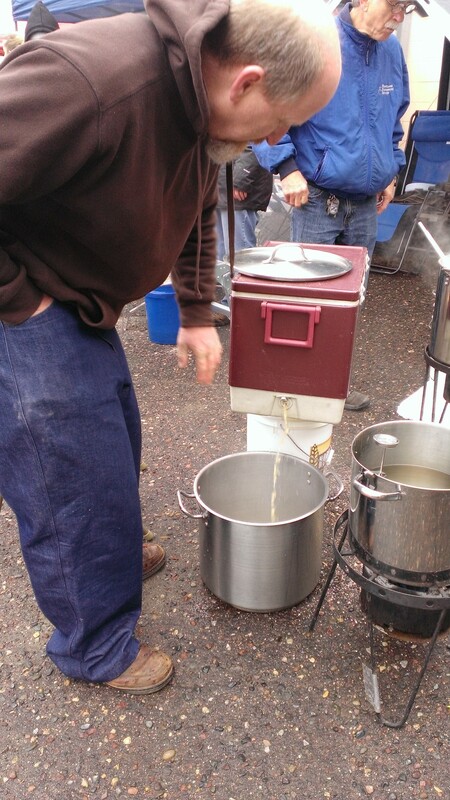 National Homebrew day celebration in Minnetonka, MN. We need to be better organized for next year like these folks! This is my 101st post on Alcohol by Volume. To celebrate, I attended Big Brew day at Lucid Brewing in Minnetonka and I’m very excited to share it with you. Today is Big Brew Day! 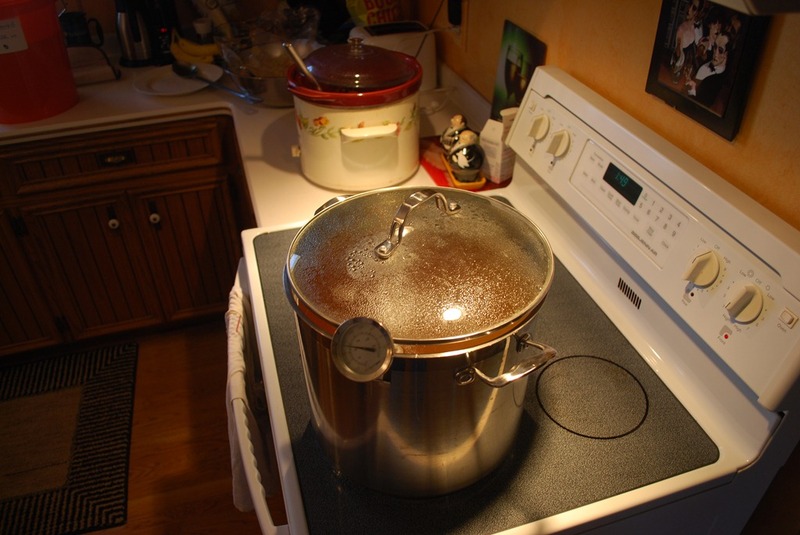 The American Hombrewers Association created Big Brew Day as a way to celebrate National Homebrew Day, announced by Congress in 1988. 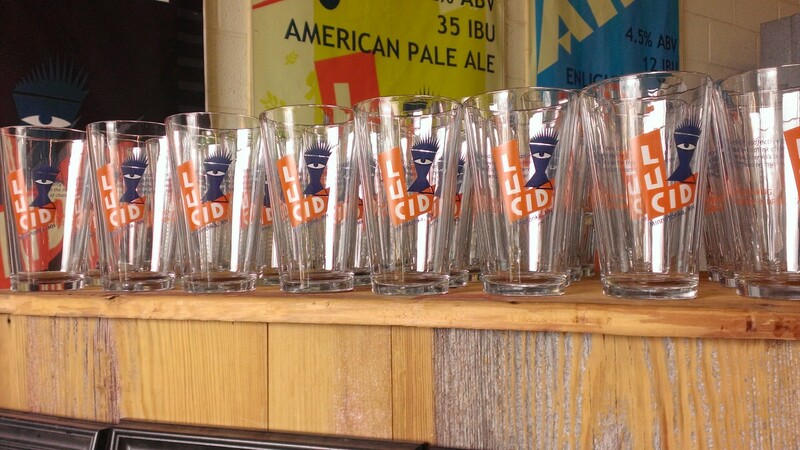 It traditionally takes place on the first Saturday in May, and this is the 3rd year that Lucid has hosted an event to celebrate and bring homebrewers together. 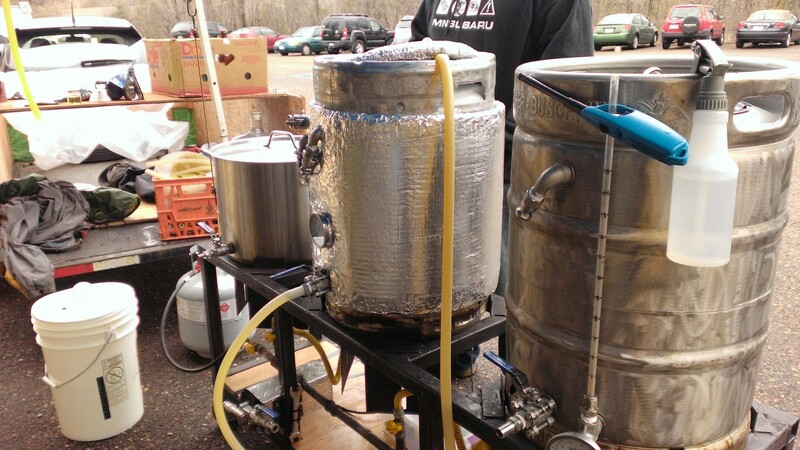 With no good way to brew outside, I simply attended as a observer, learner, and cheerleader. When I first arrived it was a mildly intimidating wall of almost exclusively men. By the time I left I had learned a ton, managed to keep warm, and made several friends! This is the one of the best books you will ever read. All you ever wanted to know about Wisconsin Beer and where to find it. Oh and guess which travel agency is listed in the second edition for their beer tour? Sometimes your travels just occur at home. 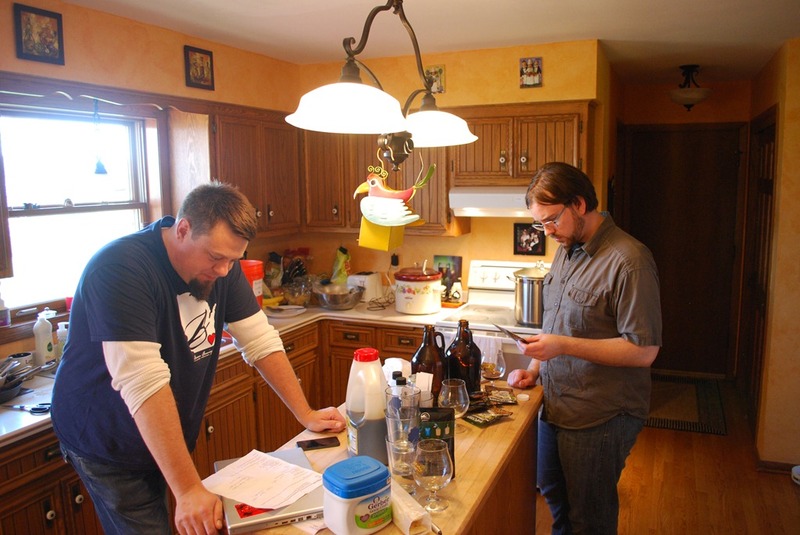 This time we travelled to the kitchen to brew beer with a soon to be famous Milwaukee brewer. Mike Brenner is a graduate of the Siebel Institute of Technology’s Master Brewer program. Mike runs Brenner Brewing company, which is a “brewery-in-planning” that will focus on craft beers featuring the artwork of local Milwaukee artists on the labels. Mike started out as an artist and still loves the art scene. Mike relates that “It all started on a sunny spring morning four years ago while homebrewing a batch of beer in front of my art gallery, Hotcakes. I realized that for 8 years people had been coming to my arts events for the beer in the keg more than the art on the walls. Then it hit me. I needed to flip the whole process. Instead of luring people into my art gallery with free beer and then trying to convince them to buy art, I should sell the beer and use my brewery as a vehicle to support and promote local artists and musicians.” Mike is currently looking for potential investors so if you have a fat savings account that you need to put to good use contact Mike. You may have a chance at investing in a new Milwaukee brewery. 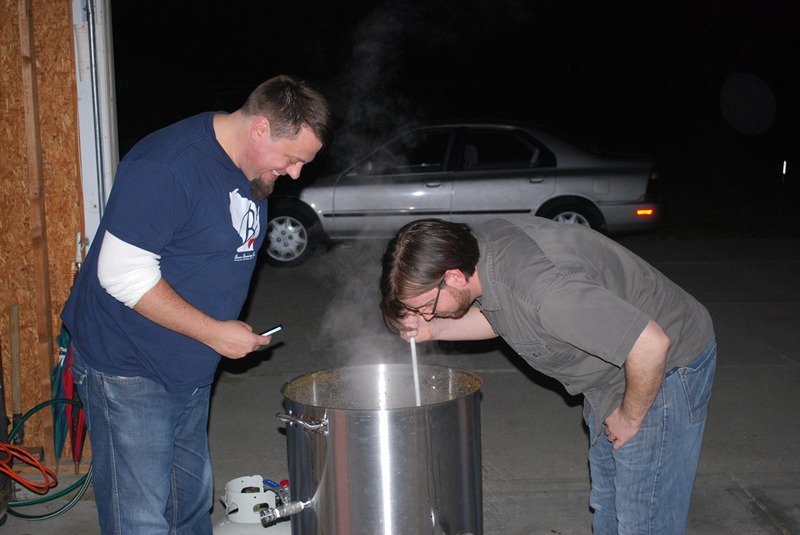 Mike started raising money to fund the brewery on Kickstarter – that was where I located him and made a donation which gave Ryan and I a brewing day with Mike at our house. Random nonsense: Here’s a video of Mike that you may have some trouble forgetting! After some discussion with Mike, we decided to do 2 batches while he was here, a Hopfen weisse and an extract version of his awesome Brenner Brewing Witchcraft Imperial Stout. That was a lot to take on with only one stove in the house, so Mike brought along his old turkey fryer burner and a large kettle for us to make the stout outside while we brewed the Weise inside on the stove. 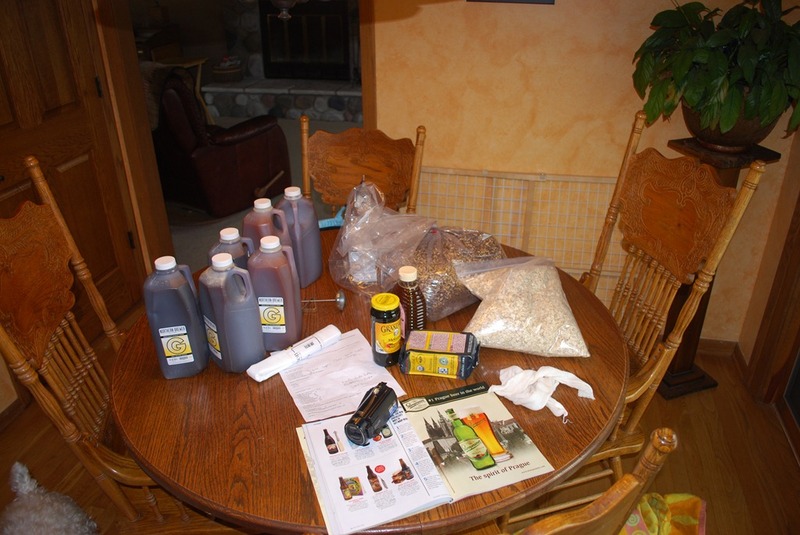 Here’s the raw ingredients, 36 pounds of liquid malt, 12 pounds or so of grain to steep, a pound of coffee, some honey, molasses and other miscellaneous odds and ends. Mike and Ryan are studying the recipe and making final preparations, adjustments and the occasional witty repartee to help pass the many hours the brewing process takes. While the hopfen weisse started in one pot, it quickly moved into 2 before boil as there was about a 1000%+ chance of boil over. Here you can see that we started the brew process in the daylight, however it was long gone by the time the stout hit a boil. It was a windy day so we put some old doors in place to block the wind to get as much heat up into the kettle as possible. This is true brewing genius level improvisation. 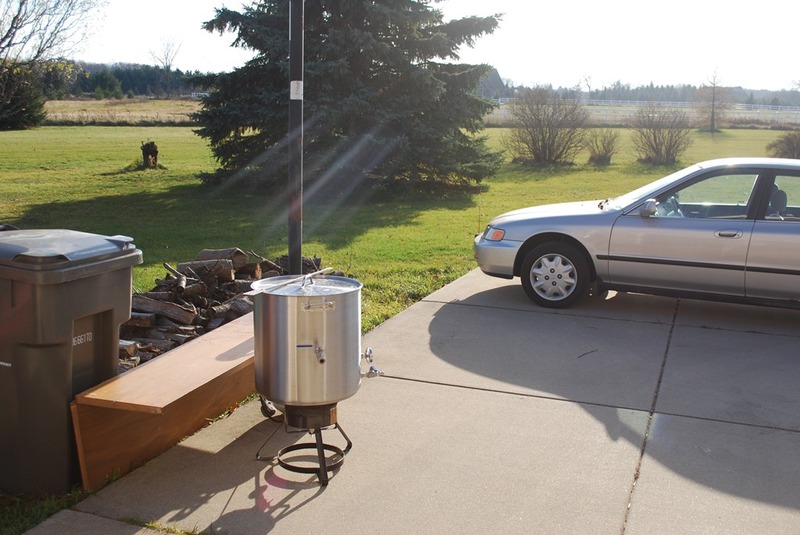 In the photo you can see an official Brenner Brewing company kettle as well as the company car! I believe it is an Austin Martin smartly disguised as a cheap domestic so it can be parked at any bar downtown without being hassled. We moved the kettle into the garage to get even further out of the wind. The sun set and a boil was eventually achieved! The stout is looking good! We made so much that we had to distribute it to 3 different fermenters to accommodate it all. The hopfen weisse was completed much earlier and is fermenting in a plastic bucket. Check back with us in about 6 weeks for the hopfen weisse and about 6 months to see how the stout developed! 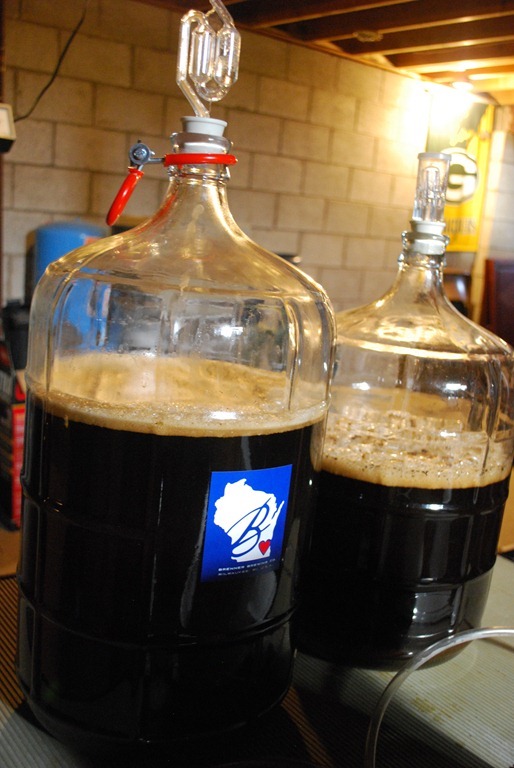 After racking the stout we added vanilla beans and oak, so it should be a big flavor bomb. We had a great time with Mike and look forward to either getting new jobs at Brenner Brewing Company once it opens or at least going for one of the tours. The story goes that Kopi Luwak (Civet Coffee) is one of the worlds rarest and most expensive coffees, coming in at hundreds of US$s per pound. It is not that the raw coffee berries are so hard to grow or that the growing climate is so treacherous or that the plant yields are so low. It’s because these beans are processed in a most special way – through the digestive tract of Asian Palm Civets. As their name implies they are found all throughout Asia in India, Nepal, Cambodia, Thailand, Vietnam, Sri Lanka, Philippines, Indonesia and more. They are normally wild and in no way an endangered species. 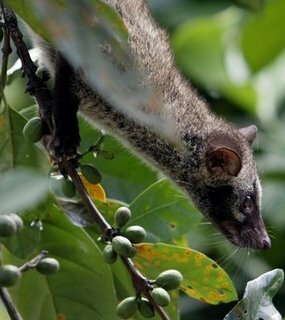 In Indonesia and Vietnam are Civet “farms”, where the Civets eat the berries and defecate them, wherein they are then harvested. Interestingly enough, the berries keep their shapes throughout their arduous journey wherein the coffee becomes more aromatic and less bitter as a result. The name, “Weasel Coffee” is an English translation of the Vietnamese name for this rather interesting culinary product. Well what happens, say if you pair up one of the worlds most unique coffees with one of the worlds most unique brewers? If you have not heard of Mikkeller, you should pay a wee bit more attention. It is a gypsy brewery founded by two Danish home brewers Mikkel Borg Bjergsø and Kristian Klarup Keller, now solely run by Mikkel. Mikkeller however is a brewery without a home. They create their brews in gypsy fashion, on the road working with hosts breweries in Denmark, Norway, Belgium, UK and US. One of their more well known and fairly widely distributed brews (well I can find it anyway) is the Beer Geek Breakfast Stout. It’s thick, black, creamy, complex, aromatic and very well flavored with tastes of bitter chocolate and coffee. These flavors come from the dark roasted malts, but if you want to amp up the flavors a bit, why not just add some real coffee? And if you are going to add coffee, you don’t want to add just any old coffee, why not go with the rarest and most expensive – Civet Coffee. Welcome to the world – Beer Geek Brunch – WEASEL. Here is our backyard tasting experience! 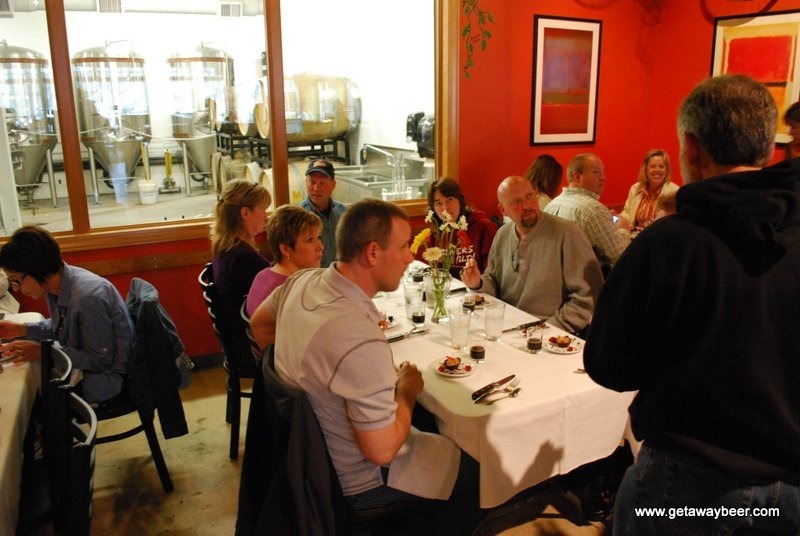 Recently we hosted a Wisconsin craft brewing tour group, that stopped at Red Eye Brewing Company in Wausau, WI for a very special beer and food pairing lunch. Let’s just start out by saying that the gang at Red Eye absolutely exceeded all of our wildest expectations for this experience. You know how when you first meet someone who has a high level of excitement and enthusiasm for their work? You can tell within just a few minutes or so that the person has great passion for what they do. Passion is definitely a good word that describes what is going on at Red Eye. One of our greatest desires with our “Microbrews & Other Tastes of Wisconsin Tour” was to have a special beer and food pairing experience. After our first visit to check out Red Eye, we knew we found the perfect place for this. 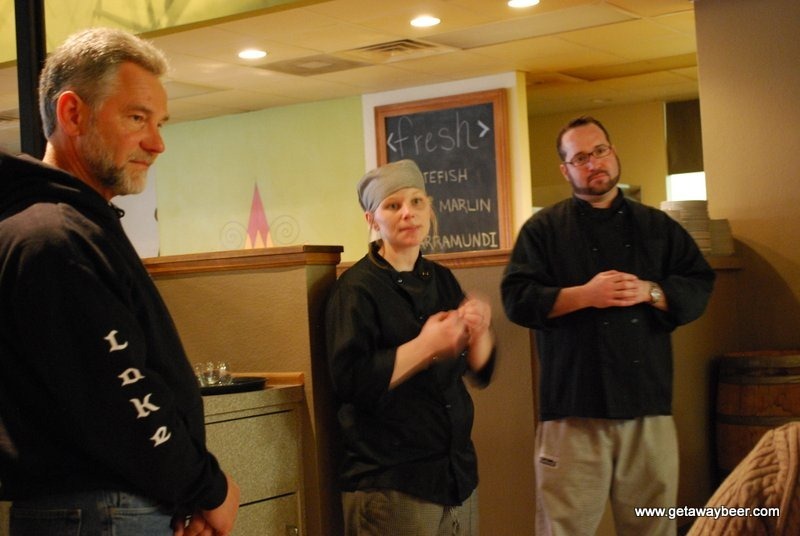 Chefs David Lorio and Beth Hinner (pictured at right with Pat Cherek) embraced our idea for the pairings for our group. Based on feedback from everyone, they created a truly memorable dining experience. The chefs designed a 5 course menu that paired up a unique hand crafted beer with complementary artisanal food. Red Eye focuses on the freshest ingredients, locally sourced whenever possible. 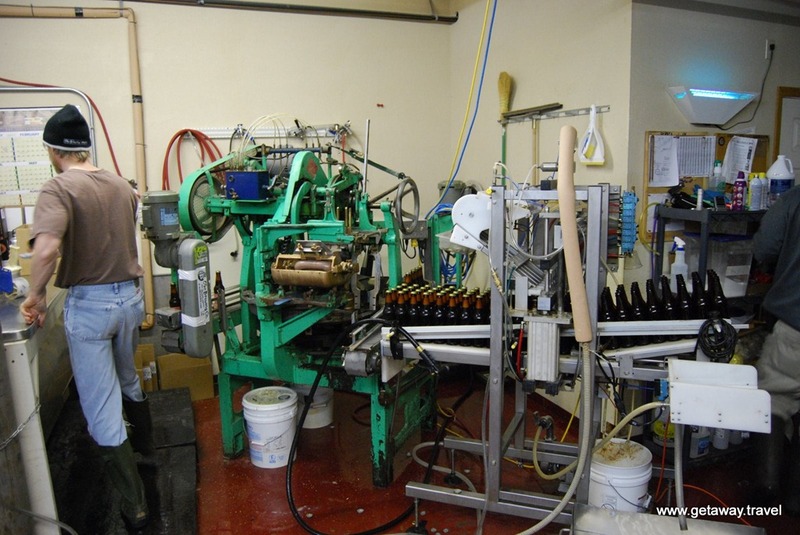 The world class beers are brewed by award winning brewmaster Kevin Eichelberger. For each course the food was described by either David or Beth and the beer description was given by Pat. So let’s take a look at the pairings! While we are not food critics, we’ll do our best to describe in words what is really better off being tasted. 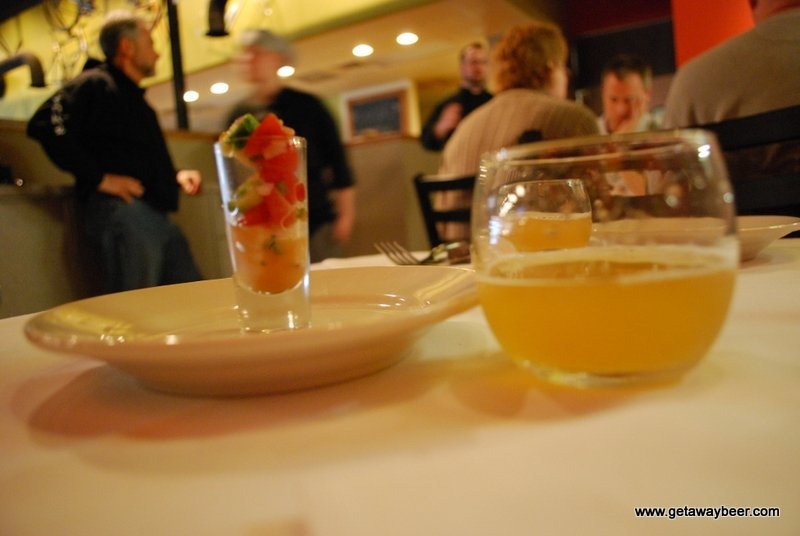 First up we have Bloom, a Belgian wheat beer paired with Fresh Catch Ceviche in a shot glass. It was a perfect compliment of the refreshing citrus flavors in the beer with the bracing acidity of the ceviche – it very quickly disappeared from everyone’s plate. What a great start! 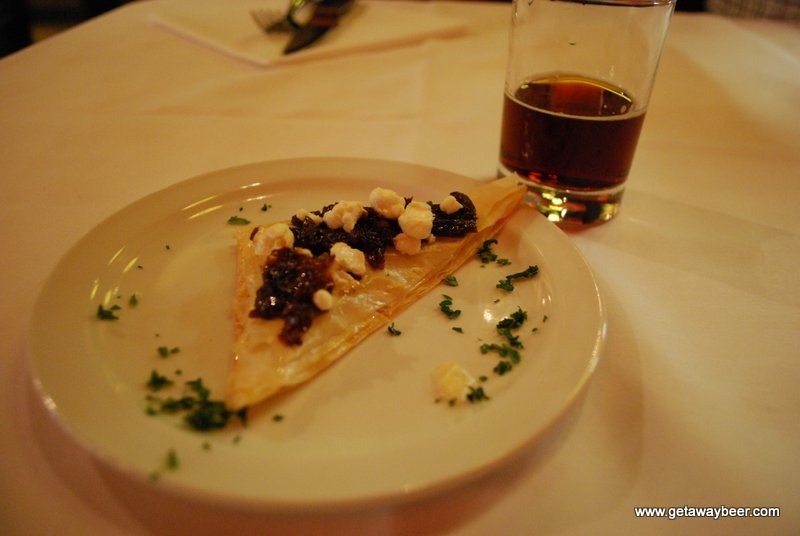 For our second course, Chef Beth prepared a Goat Cheese and Raisin Compote on Filo. The raisins were lovingly bathed overnight in Scarlet 7, a Belgian Dubbel that was also the beer we tasted with this dish. We will never look at a raisin the same way again, they were beautifully transformed and taken to a whole new level. The simplicity of this creation really hides the subtle complexity of the flavors that came through. Absolutely delicious. Now it was time for some soup. 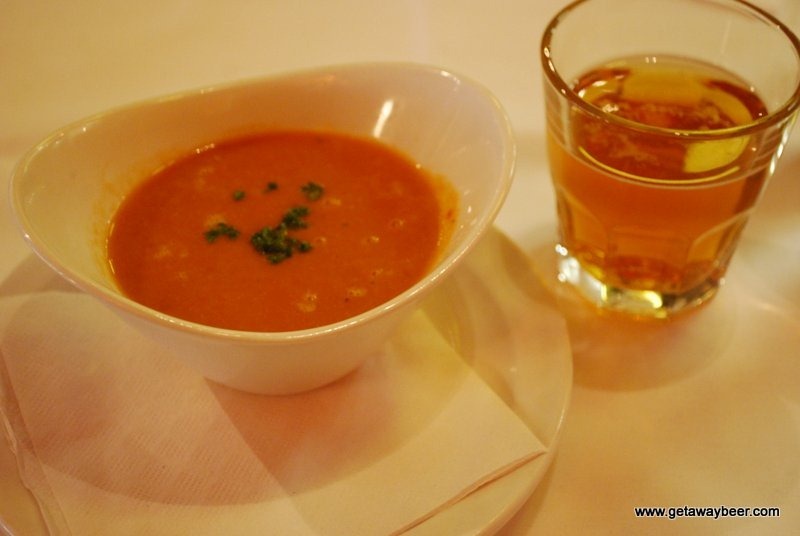 How about Shrimp Bisque and Thrust, an American style Pale Ale? The soup had tremendous depth of flavor and a pleasant biting edge to it. The hoppy bitterness of the beer, softened up a bit as it not only complimented the soup, but had to compete with the soup for the attention of your tongue. It was a good competition and both the soup and the beer won! Now it is time for the main course. A couple of weeks before our visit, Red Eye had just released Smolder a Marzen Rauchbier . Once upon a time, all beer malt probably had a smoky quality from the wood that would have been used to fire the kiln, but eventually they found ways to dry malt in a smoke free manner and called it progress. In the northern Bavarian town of Bamberg there is still a pocket of old styled Rauchbier being brewed, but for this beer experience we don’t have to go to Germany, as brewmaster Kevin created the flavors for us right here in Wausau. What could possibly pair better with Smolder beer, than smoked pork ribs? Really only one thing, Smolder with David’s Red Eye smoked pork ribs with jalapeno corn bread on the side. 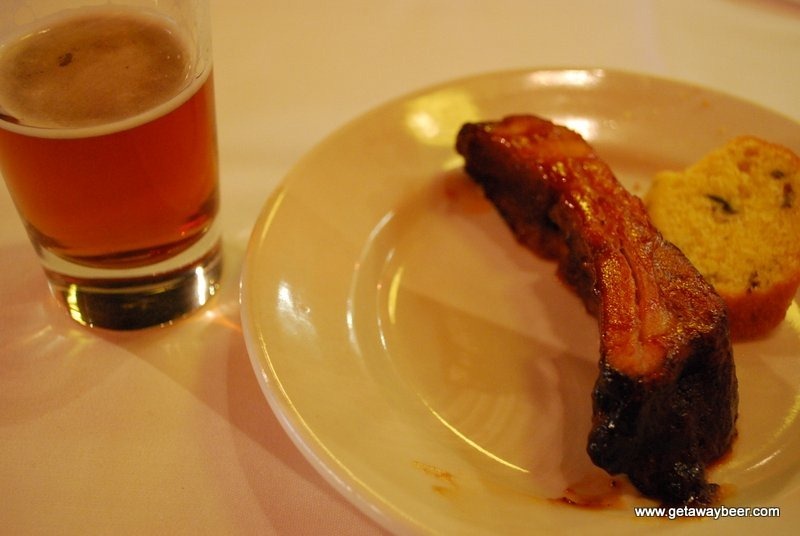 Now you would certainly not describe Red Eye as a rib joint, but here is a typical comment from folks on the tour – “Best ribs I’ve ever had”. The meat was moist, flavorful and oh so wonderfully tender, and yes they actually were the best ribs we ever had. Still hungry? It’s time for dessert! 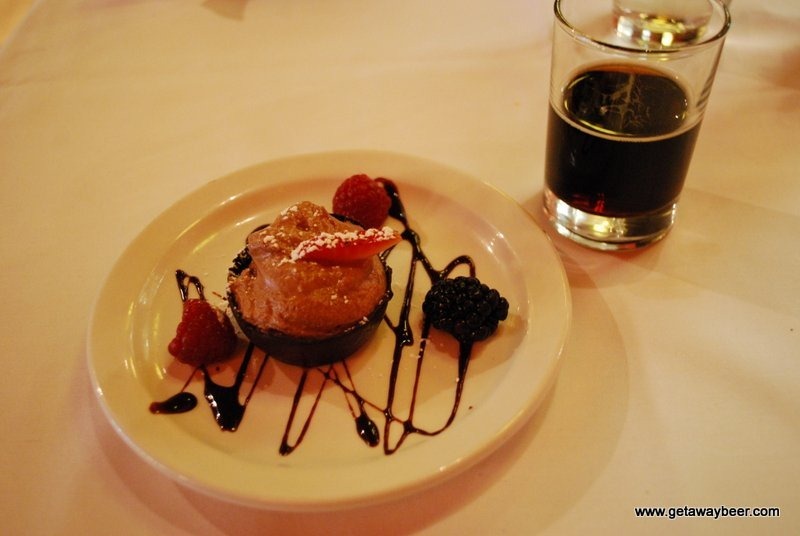 Now beer is not often thought of as the perfect drink to go with dessert. It may be true that not every beer pairs well with dessert, but if you happen to have a great stout handy, bring on the chocolate! This is exactly what Chef Beth did for our group, she created a chocolate cupped coffee mousse and paired it with Veruca Milk Stout. There are great coffee notes in this stout. Milk Stouts are created by adding lactose which is an unfermentable sugar derived from milk. In the hands of a great brewmaster the addition provides wonderfully mild sweetness and a fuller body to the beer. The chocolate mousse was creamy, sweet and oh so divine. Several of the guests asked Beth if they could get her recipe. It was a great meal, great beers and gourmet food, transformed into a really unique experience by eating it with a view of the brew tanks on one side and the open concept kitchen on the other. Everything was seamlessly woven together by beer descriptions from Pat and Food descriptions from David and Beth. We weren’t done yet, but the group broke into applause to show their enthusiastic appreciation. The food was all gone, but it was time for a tour of the brewing area, and then afterwards some time to relax at the bar before we have to head out. Pat explains the brewing process and what makes Red Eye and their craft beers unique. 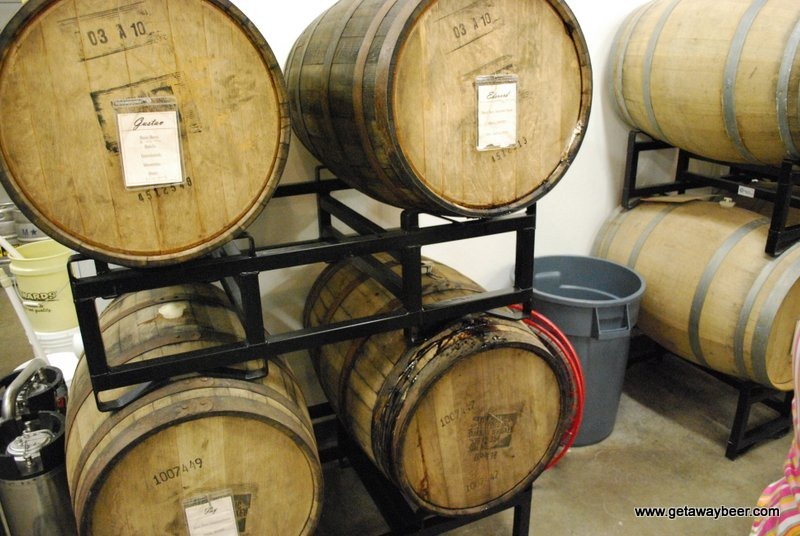 We will need to make a return trip for when these barrel aged brews are released! I know I saw an Imperial Stout there. OK I think by now you get the idea that we really loved our beer and food pairing at Red Eye – just amazing. For our 3 day tour, it was definitely one of the highlights of the trip for everyone. We have not scheduled the next tour yet, but if you want to get on the list to be notified you can sign-up at www.getawaybeer.com and if you like us on Facebook, you’ll also be one of the first to know – www.facebook.com/getawaybeer. We’d like to reveal one secret about Red Eye, that you may not know. If you are in Wausau with us on a beer/food experience or go to visit on your own, about 5 minutes away from Red Eye is Bull Falls Brewery. In a future blog, we’ll let you know why they are also worth a visit. At this point in time, we are only about 1 1/2 weeks away from our inaugural tour – “Microbrews & Other Tastes of Wisconsin”. We are a bit excited, a bit anxious and honestly, just a bit stressed out; custom group tours are a lot of work to set up! Our leisure travel agency – GetAway Travel Service has been in operation since 1998. Over that time, we’ve sent thousands of our wonderful clients on many fantastic vacations covering almost all of the globe. We’ve also handled our fair share of group travel – destination weddings, cruise groups (Caribbean & Alaska), spring break groups, bachelor/bachelorette trips and many others. 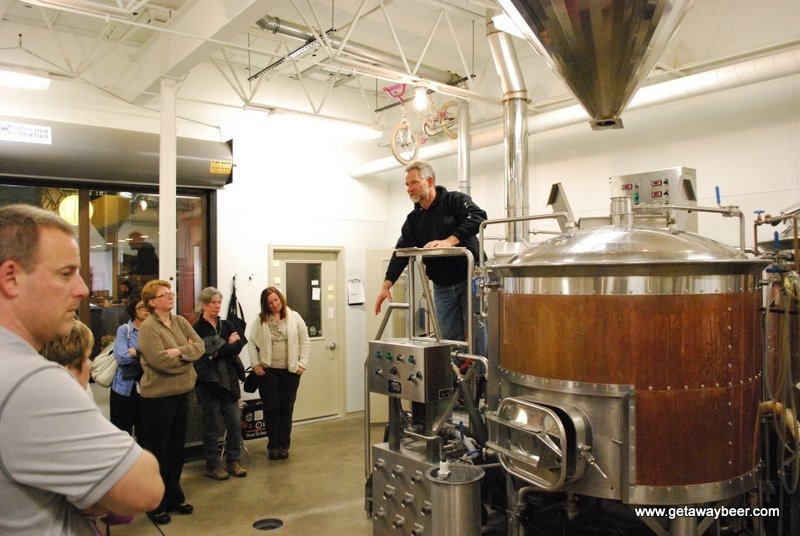 This is now our first fully custom group tour dedicated to the art of craft brewing. The complete tour itinerary and all of the tour experiences have been shaped through our efforts. We’ve made the luxury motor coach arrangements, the tasting notes booklet, and the meal arrangements. We’ve worked with all of the craft breweries to set up timing and customize the experience for our clients. We cannot possibly stop at all the breweries & brew pubs in Wisconsin, but we do think our selection for this tour is first class. Our agency is located in southeast Wisconsin about 30 minutes outside of Milwaukee. While there is certainly some fantastic craft breweries (Lakefront, Milwaukee Brewing Company, Sprecher) and brew pubs (Hinterland, Water Street, Saint Francis, Milwaukee Ale House) in Milwaukee area, we decided to focus on taking people to less trafficked locations in southwest and central Wisconsin. Here we go with Day 1. The initial tour pickup point is in Waukesha, Wisconsin. From there we will make a short 40 minute drive to Tyranena in Lake Mills. If you like India Pale Ale, you may already be familiar with their highly rated Bitter Woman IPA which can be found on tap at many great bars in Wisconsin. 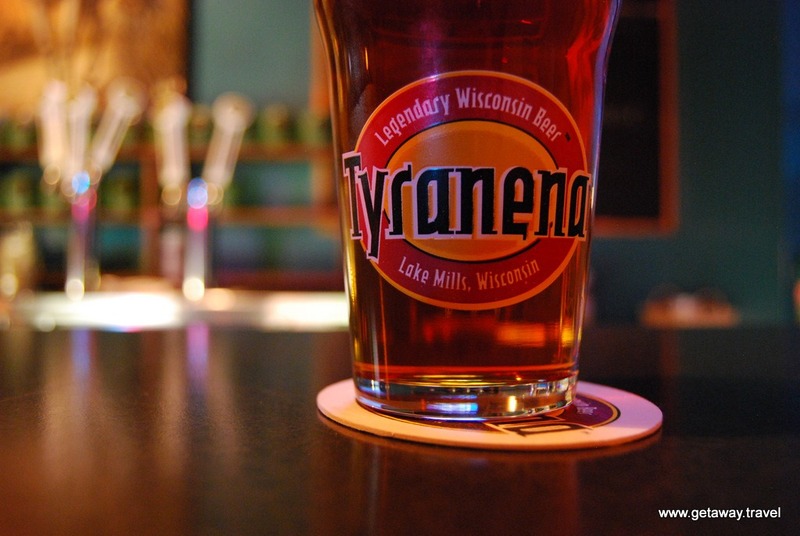 Tyranena beers are named for local legends and all of them have a great back story that entwines the beer with local lore. For example, Rocky’s Revenge is an American Brown Ale that pays homage to the legend of a giant serpent that was supposedly around to protect the sacred stone tepees which are now at the bottom of Rock Lake. The stone tepees themselves are immortalized in Stone Tepee Pale Ale. Get it? It all weaves together in wonderful fashion and is a great example of local brews telling the story of where they are from. It does not matter if the legends are real or imagined, the beers are great, and the stories make the experience all the more rewarding. Our next step is a bit of a drive further west, but it’ worth any additional effort to get to the quaint hamlet of Potosi. 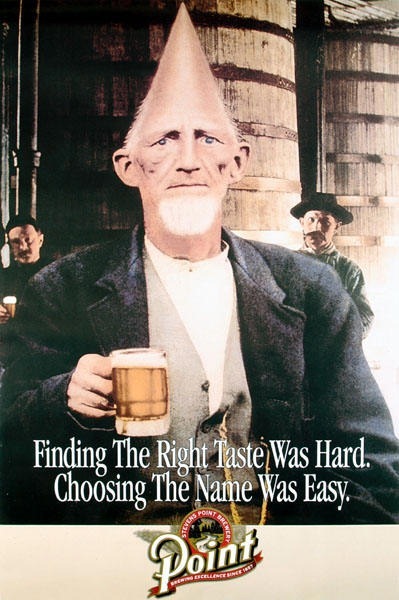 The Potosi brewery began in 1856, and after 120 years of operation, was shut down and basically left to rot for 30 years – the story is told on this excellent video. The video was shot as part of the Comeback Wisconsin Beer Movie. (can’t wait to see it soon!). The great state of Wisconsin was once the epicenter of a brewing in the United States, with over 240 breweries in 1880, and now it is all coming back with over 70 Wisconsin breweries and counting, in 2012. Potosi is one of the greatest places to experience all of this history. The brewery has been restored and in addition is also host to the National Brewery Museum. One of the greatest assemblies of American brewing collectibles anywhere is now here in a permanent home. Of course the trip is not complete without sampling some great Potosi craft beer. Brew master Steve Buszka, originally from Kalamazoo Brewing Company (now Bells) is serving up some brews that are making new history here in Potosi. Hopefully they will still have some Tangerine IPA on tap for our visit. If not, there are still many year-round and seasonal options that will provide for an inspired tasting. While Potosi also has a great brew pub, we will be moving on to Mt. Horeb for dinner. Perhaps originally best known for the carved wooden trolls found along the “Trollway”, Mt. 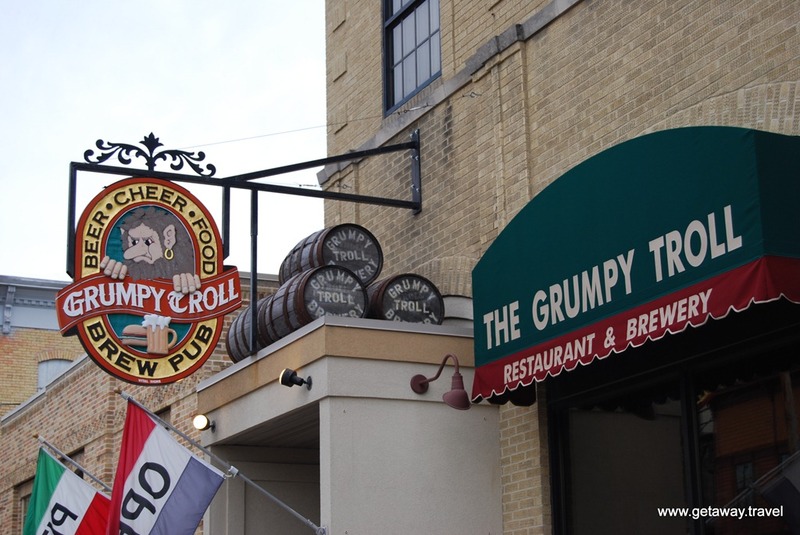 Horeb is also home to the iconic Grumpy Troll Brew Pub. With a gourmet pizzeria upstairs and a brew pub on the main floor, the Grumpy Troll has everything we’ll need to satisfy our hunger and thirst. 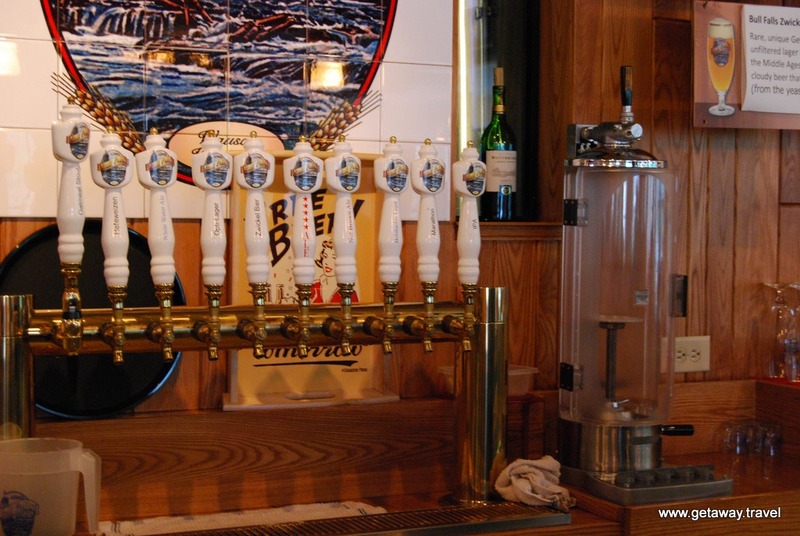 With typically 12 brews on tap at any give time, there is much to choose from. Both German and American style lagers, Belgian style triple, Erik the Red Amber ale, Farmhouse ale with local honey, Amnesia Baltic Porter, and an Imperial IPA named Maggie, after Margaret Thatcher, the ex-prime minister of Britain (she’s diplomatically bitter). The Grumpy Troll truly takes you on a beer tour of the world. But don’t worry, Wisconsin is very well represented on this tour with the Hop Farm Pale Ale made with 100% Wisconsin grown hops and barley. While the troll himself may have a scowl and be grumpy, we’ll be merry and happy trolls ourselves after this tour stop. That’s all we can get done in the first day, so we will head to Madison area for our overnight. 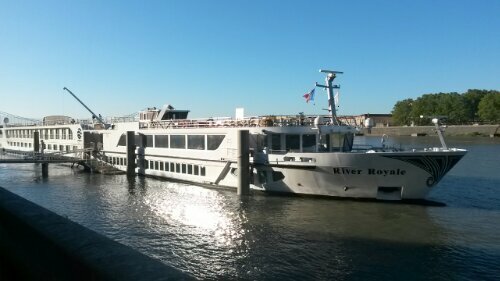 Good Morning – welcome to Day 2 of our tour! Let’s start the day out right with a distilled spirits tasting. Don’t forget, this is the Microbrews and Other Tastes of Wisconsin Tour; other tastes does not always necessarily mean food. Tucked in the Madison area between Lakes Wingra, Monona and Lake Wauseba is Yahara Bay Distillers. With a portfolio of spirits that keeps expanding, this will be a great morning stop. 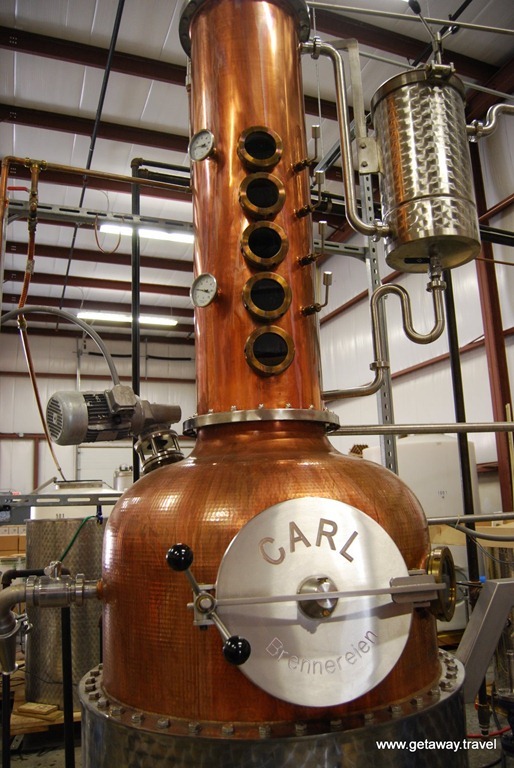 The premium vodka, gin, rum, whiskey all begin their lives inside “Carl”, a very handsome 90 gallon copper still. There is something for everyone here; even if you are not a cocktail drinker, you will still appreciate the local Lemoncella and Holz’s Apple Crips Liqueur. Well we cannot linger too long at Yahara Bay, it’s time to head north. Everyone in the Midwest has heard of Stevens Point Beer, an d we are going to tour the brewery. There is more to Point Beer, than just the Point Special Lager that you may already be familiar with – they also have an amber, a brown, a blonde, a black, a white, a pale ale, and a wheat beer. Point also has their own “premium” line of Whole Hog limited release brews. The Barley Wine is a worthy gold medal award winner at the 2012 World Beer Championships. My advice, drink some now and “cellar” a few bottles and try it again in a year or 2, you will not be disappointed. You’re in Wisconsin – where’s the cheese? Honestly there are a lot of cheese options in Wisconsin, some are described as artisanal, some are a bit more mainstream. In the small town of Rudolph, there is the Dairy State Cheese Company – a perfect blend of both the gourmet and the mainstream – squeakiest curds ever and other fantastic styles for every pallet. This place is such a regional gem, that if you do not go here, you will not be able to find it’s cheese. No website, no Facebook, no twitter, just cheese. Oh and the prices are so low, that they only accept cash or checks. This is not your big city cheese monger- you are in ruralville USA folks! Dinner tonight is at the Great Dane Brew Pub in Wausau. With 4 pubs in Madison, the 5th and newest one in Wausau is definitely the one located the furthest north. Some beers are unique to each of the Great Dane locations, so it is definitely not a been to one, seen ‘em all sort of place. The Wausau pub opened in 2009 after extensive interior renovations to a historic local building. The beer sampler is served on an aptly shaped dog bone platter. With tasty food options including the requisite fried cheese curds appetizer, dinner here is sure to please. Great Dane also makes it’s own sodas: Root Beer, Cream Soda and Ginger Ale. At this time, I don’t know for certain what will be on tap for our beer choices, but typically they have special cask ales available. Tapped directly from their British Firkin Casks, these beers have typically undergone a secondary fermentation and dry hopping. What’s a firkin you say? A firkin is just an old English unit of volume. 1 firkin of beer is equal to nine imperial gallons or a quarter barrel of beer. Couldn’t we just say they have some special quarter barrels on tap instead? No, firkin is a much better word and is more firkin fun to say. That was a great day 2, but we’ll need to rest up as day 3 is packed! Day 2 started with a pleasant taste sensation at Yahara Bay – Day 3 is changing things up a bit and we will have our first taste sensation of the day at family owned and operated Nueske’s in Wittenberg. The best Applewood smoked meats in the state/country/world/universe are right here at the company store in Wittenberg. It is the only complete retail facility they have. Bring a cooler with on the tour, as you will be wanting to fill it up with all of your great finds at this store. Not to be missed is the Applewood smoked bacon and the smoked pork chops. If you’ve never been to Nueske’s, you’ll be thanking us for turning you on to one of states greatest culinary secrets. While you may want to spend the whole day sampling and shopping at Nueske’s we need to move on to another local treasure, but this one is in Wausau. Redeye Brewing Company is hosting a special beer and food pairing lunch. I’ve blogged previously about Redeye, discussing their artisan food and handcrafted beer. There are couple of things that make this tour stop special – the only place to experience Redeye beer and food is at the brew pub, AND head chef David Lorio is creating a special beer and food pairing just for our group. This will be a stop to savor…Beer & Food…gourmet, artisanal, enough said. 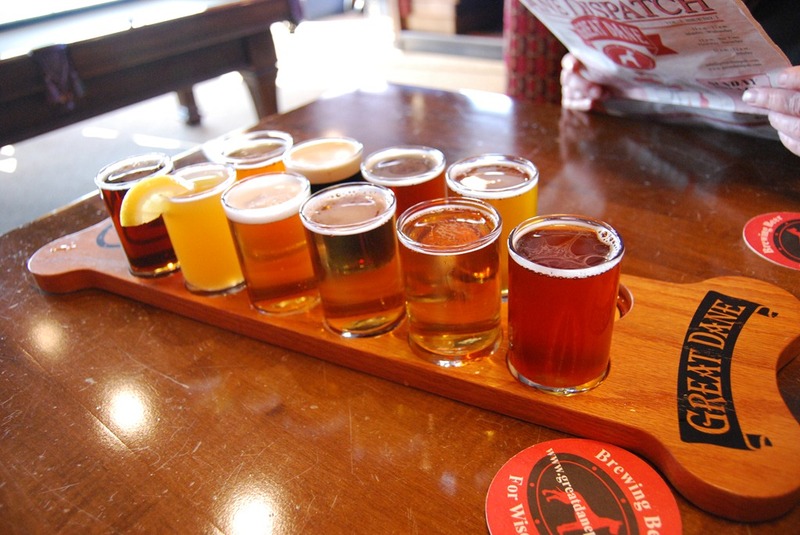 You’ll learn to appreciate what a great beer destination Wausau really is, because after lunch at Redeye we load up the bus and will drive about 10 blocks and unload ourselves at Bull Falls Brewery. While one of the new kids on the block, Bull Falls is also all about history. 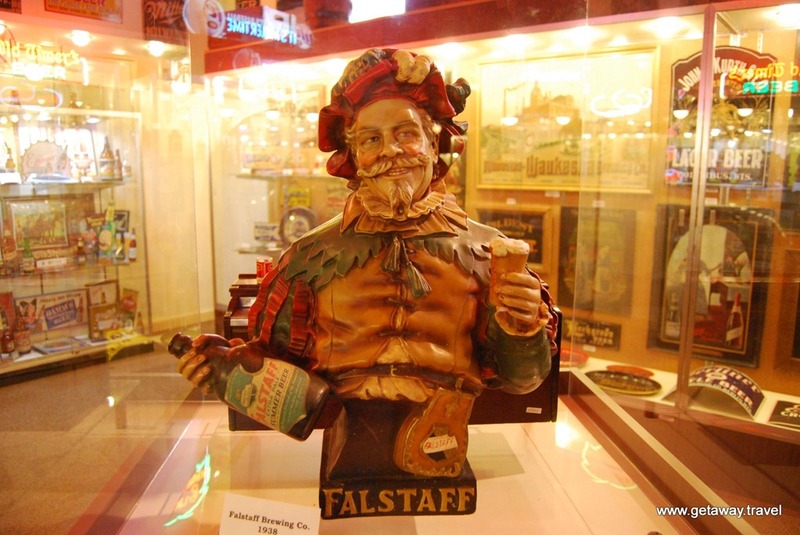 Bull Falls pays homage to German beer purity law that originated in the year 1516. The Reinheitsgebot legally codified the only ingredients that could be put into German beer: water, barley and hops (they did not know about the yeast in 1516, you need to fast forward about 300 years before Louis Pasteur figured this part out!). I can just picture the German barley farmers lobbying campaign pushing this forward, while the wheat and rye farmers all protested. At Bull Falls, you’ll find some of Wisconsin’s best lagers that fit the Reinheitsgebot framework, including unique and rare styles such as Zwickel Beer. Smooth and naturally cloudy this beer style comes from the middle ages direct to your palate today. A unique tour, great beers and a really cool growler filler for any brew that you’ll want to take home are all here at Bull Falls. The next stop is Plover and the brewery that has put Plover on the brewing map is O’so Brewing Company. As a result of his long love of home brewing, Marc Buttera and his wife Katina opened a brewing supply store – Point Brew Supply. Sometimes our hobbies just take over everything we do and one thing led to another for the Buttera’s and O’so Brewing Company was born and yes the beers are O’so good. The brewery was packed to the rafters during our visit last year, and they have since taken the brew supply store and brewery to a new larger location in Plover. With lots more room, they also were able to add a Tap House. Their main stable consists of The Big O, Hopdinger, Rusty Red and the multiple award winning porter – Night Train. They also have many special releases; here in Wisconsin, the deer hunting season is a huge event, and nothing helps the food go down easier at deer camp than O’so Doe in Heat seasonal. My favorite seasonal is the highly rated Lupulin Maximus. If you are a hop lover then, this beer is worth the effort to seek out. It’s a big Imperial IPA with whole hop cones in every bottle! At O’so they are passionate about their beers, but they certainly want to have fun in their work – me too. Well the tour is coming to an end, but on the way back towards our starting point let’s stop for some dinner. Located on main street in West Bend is the Riverside Brewery & Restaurant. This restaurant has it all, a refined menu with great sandwiches, steaks and seafood – we have never been disappointed here. Special things happen at Riverside, not many Wisconsin breweries make a Abbey Dubbel Ale, using 100 pounds of honey and fermented on oak. OK, this is a bit of a tease because the Broken Abbey Dubbel Ale, may not in fact be available while we are there, but there surely will something else every bit as special. That brings up a good point in that almost all of our breweries and brew pubs make varieties that are only seasonally available. So one trip won’t be enough, you will need to go back again and again. What better way to do it than on a tour where you can leave the driving to us! We hope you enjoy the tour – we look forward to doing this again. As of the date of this posting, there is still some space available for the March 29-31, 2012 inaugural – so don’t hesitate – call (262-538-2140) or email (paul@getaway.travel) us soon.